Ready To Die from Iggy & the Stooges is out today - buy it now from iTunes, Amazon, or your favorite record store. Even more Stooges goodness is set to be released in June. 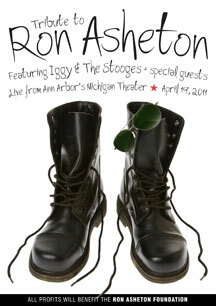 The Ron Asheton Tribute Concert that took place April 19th, 2011 at the Michigan Theater in Ann Arbor will be released on DVD on June 4th. The concert was a celebration of Asheton's life and music and included a full set from the Stooges (and a string section on some tracks) with guests Henry Rollins and Deniz Tek (aka Radio Birdman). Profits from the sale of the DVD will go to the Ron Asheton Foundation. Watch the performance of "I Got A Right" from the DVD below courtesy of Rolling Stone .